Nice, do you use this project in your own home automation project? Bluetooth as presence detection has been discussed a few times here on the forum.. How reliable is it? Especially with newer phones where the bluetooth goes into sleep mode? Congrats to the hackaday publish BTW. Yes, I do. I mainly use it to detect who is in what rooms and track down things my very young son likes to hide, like the TV remote! While I do use my Nexus 5X phone sometimes to simulate an iBeacon to keep track of it, I don't always carry the big phone around. So this project was designed to work with small, cheap beacons like Estimotes, but it can also use anything that advertises itself over BLE. Like a Fitbit that someone would carry around on their person anyway could be used for the presence detection. It doesn't rely on the phone scanning for beacons, so that makes it more reliable and lower latency. It's a bit like the inverse of normal beacons, which stay in one place and your phone scans for them to detect them. Instead, this device stays in one place and detects beacons that are carried and moved around. I hope that makes sense. @gyro Sure, anything is possible, right? I think it could use an nrf24l01+ but the reason I chose BLE was because most common and user-friendly beacons have BLE rather than nrf24 chips inside them, same with most phones. However if you choose to make a BLE beacon using the links you provided with an nrf24l01+, the Happy Bubbles detector should be able to detect it just fine, if you want to make your own beacon that way. The thing is, this unit doesn't really broadcast out as a beacon, it instead listens for those broadcasts. I'm not sure that's possible to do with the nrf24l01+ right now. Following the comment of @hek i'm also interested to see how to deal with phones. As iPhones indeed stop advertising in sleep mode, more and more Android phones don't even allow advertising. On my Nexus 5x it will advertise pretty well using Nordic's nrf connect app emulating a beacon, but it does still sometimes pause, you're right. To be honest, this product was primarily developed to work with the small coin cell powered beacons. People in the home automation space already have a number of solutions available to track location with phones. But some people didn't want to use a big, expensive phone for everything they want to track, like small children, pets, or if they simply didn't want to carry their phone around with them everywhere in the house. @nemik Congrats on the project. It looks really interesting so I bought one to play around with. I was going to use my Nexus 5 for testing but just realized it can't act in transmit mode. Do you have any recommendations for small beacons? The Estimotes beacons look big and the stickers don't look like they'd be very good for tracking people since they don't have a key ring. I've been looking at these. Think those would be good? The ones I've bought some samples of and like quite a bit are these: https://www.alibaba.com/product-detail/Bluetooth-nRF51822-iBeacon-Protable-UFO-Beacon_60377700306.html and I'll soon put them up on my store. They're the ones I've been shipping as part of the 4-pack on the site. They're quite nice and small with good RF and battery life. I wish they sold them on Aliexpress or someplace like that. @nemik I agree with you regarding the best use of this technology: with tags. However some people sleep with the Smartphone under the pillow, so they definitely take it anywhere they go and want to use it for positioning. Business wise I’m working with a lot of solutions for indoor positioning. We more and more see smartphones not being able to advertise. Especially the androids running on Android 6. And a sleeping iPhone is of the grid also. Another question: looking at the documentation the nodes are operated on a wired power source. Can they be operated on batteries as well. What is be the power consumption and resulting on that the potential battery lifetime? @bisschopsr Yea I understand about the carrying smartphone everywhere, but my product just won't work super-accurately with it because of the limitations of the BLE peripheral mode of the phones. Unfortunately there's not much I can do about it. Great question about power usage, it forced me to whip out my uCurrent Gold and measure the consumption. You can see it here: http://i.imgur.com/qvKXjsT.png sorry I tried to upload with the forum, but it kept giving me a 405 error about adding images, not sure why it's not working. 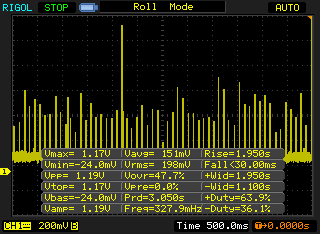 Anyway, it's set to 1mA per 1mV measured so you can see from the image that on average it uses about 150mA at 5V source. So depending on how long you want to run it, you'd need to size your battery for that. I just power them with a USB charger but you can just as easily use any ol' USB phone charging power bank thing. That's what's nice about just having the micro-USB port on there. Like a Fitbit that someone would carry around on their person anyway could be used for the presence detection. Has this been tested with fitbit? Am interested now. And an enclosure of some sort would also help it blend into the decor too. I did get a chance to test with a Fitbit recently. It technically worked, but not all that well. The thing is, the Fitbit only advertises every 2 seconds so latency is a bit high. But worse, its apps really want to be connected to it often to sync; and whenever it's connected, it stops advertising and the detector then can't pick it up. At this point I don't plan to modify the board much but having it read environmental sensors would be a cool feature! For that, would be nice to make little beacons that read sensors and advertise/broadcast the readings every few seconds. Then they could be very low-power, run on coin-cells for months, and could be placed anywhere instead of needing it to be hooked up to USB power like the main board is. Like these: https://sen.se/peanuts/ I'm curious if it could read them. As for enclosures, I know. I would love to have some nice ones but at this point I'm making too many boards to 3D print enclosures, but too few to afford injection-molding tooling to make a custom case.